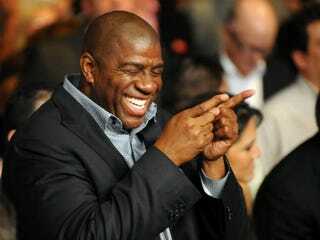 Magic Johnson's famous smile was plastered on the faces of Los Angeles Dodgers fans everywhere on Wednesday. Their beleagured team has finally changed hands, and Johnson's ownership group is taking over. "It's great not only for the Dodgers but for the city," fan Charlie Alvarez told the Los Angeles Times. "Now that Magic is with the Dodgers, I expect to see championships. He's a winner. Anything Magic touches turns to gold." Transforming the Dodgers would be one of Johnson's greatest feats yet. The franchise has one of Major League Baseball's richest legacies, but the organization fell into disrepair the last several years under owner Frank McCourt. The Dodgers struggled financially and on the field as fans stayed away in droves. But that didn't dissuade Johnson and his partners from making a $2 billion bid for the team in bankruptcy court. Johnson is a minority investor in the group, but he'll be the face of the franchise, a vital role as the Dodgers attempt to re-establish the bond with disgruntled fans. Johnson is no slouch as a businessman, having sold his 4.5 percent stake of the Lakers and his 105 Starbucks franchises a day apart in 2010. That gave him more than $100 million to use in his pursuit of a sports franchise, including his interest in bringing the NFL back to L.A. But the bulk of the financial muscle in the Dodgers' deal comes from Mark Walter, CEO of a financial-services firm that has more than $125 billion in assets under management. He enabled the group to smash the record for highest price ever paid for a pro sports team ($1.4 billion for England's Manchester United soccer team) and nearly double the record for a North American sports franchise ($1.15 billion for the Miami Dolphins). With MLB's dearth of African-American fans and players — and baseball's stated desire to improve those numbers — it's not surprising that several groups that bid on the Dodgers requested Johnson's involvement. But he liked what he heard from Walter, which should put rival teams on notice. "The first thing I asked Walter was, 'Do you want to win, and do you want to put money in?' " Johnson told the Los Angeles Times in December. "He said, 'Absolutely' … He told me three times, 'All I want to do is get to the World Series.' "
Johnson has been a winner for most of his life. He led his Michigan State Spartans past Larry Bird's Indiana State Sycamores for the NCAA men's basketball championship in 1979. He led the Los Angeles Lakers to five NBA titles. And he beat HIV, helping us relive that compelling battle in an excellent Nelson George film earlier this month. Working his magic on the Dodgers won't be easy, and he won't call all the shots, a job that falls to longtime baseball executive Stan Kasten. But Johnson said he wouldn't have invested his hard-earned money or his reputation unless he believed in the product and believed that he could make a difference. That alone is enough to make MLB executives and Dodgers fans happy and optimistic.